"Yes Yes In Your Eyes"
The celebrated orchestra leader Sammy Kaye brings the sweet and melodic Sunday Serenades with musical guests and a variety of musical styles. 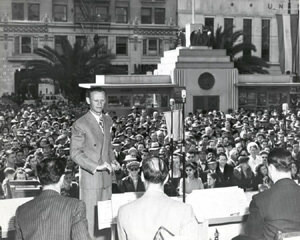 A leader in big band for over 40 years, he starred in the Sunday Serenade in the 1940s to the early 1950s. 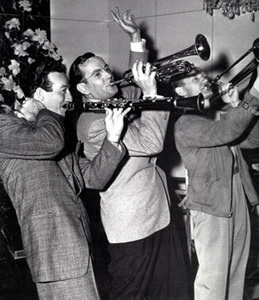 Born in Rocky River, Ohio on March 13, 1910, young Sammy always loved music. Kaye used a football scholarship and played music in a band called "The Ohioans" at Ohio University to pay his way through college and majoring in civil engineering. Kaye took a risk after college when turned toward music for a profession and not the safe-bet white collar work as a civil engineer. On Sunday Serenade radio program, Kaye's would read poetry sent in to his show by amateurs and later several books of poetry from the show were published. The songs and the poems intertwine for a relaxing half hour of entertainment and reflection. 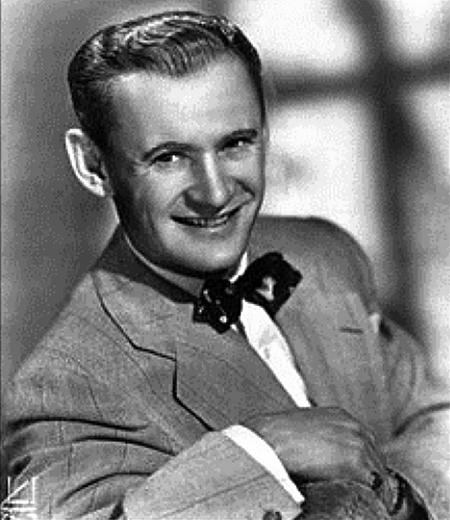 Sammy Kaye equaled musical luminaries such as Benny Goodman, Artie Shaw, Jimmy and Tommy Dorsey, and Glenn Miller. Sit on the porch and enjoy Sammy Kaye's Orchestra play swing and sway music to the delight of your family and friends and maybe even neighbors! Please note Sammy Kaye's Chrysler Showroom recordings appear on Volume #4 of this collection as well as a number of additional Sammy Kaye Orchestra performances. For more dreamy music, see also: Moon River, Strollin' Tom, Enchanted Hour, The NEHI Program, Choose a Song Partner, Tony Won's Scrapbook, Words with Music, Memories of Hawaii, and Royal Hawaiian Hotel. For more poetry, see Anthology.